I try leaping out in the road waving my arms and shrieking (something I tend to do often) but it’s too late. We’re going to miss the closing ceremonies of the Seychelles Carnival, an event I’ve been looking forward to ever since the opening ceremonies were over. This is going to be a huge event, the firecracker culmination of the 5th largest carnival in the world, the Carnaval International de Victoria. 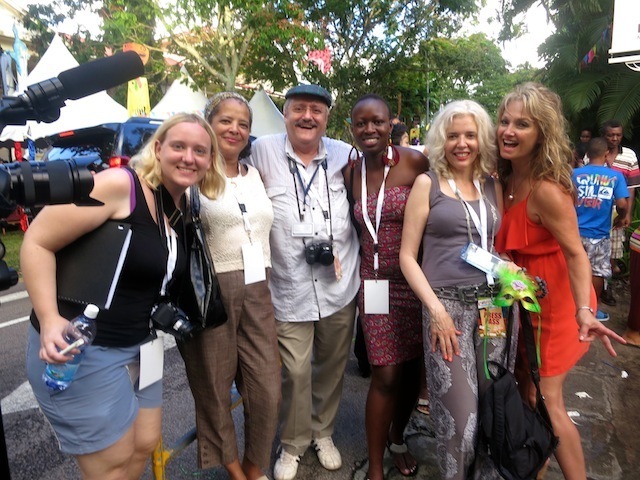 This is our last chance to spend time with the journalists we’ve met, like my friend Bea Broda and new pals Wolfgang, Elvis and Kitty, it’s our last chance to see the carnival dancers and performers from all over the world, our last chance to experience Seychelles culture at it’s liveliest. “This is the worst day of my life,” says Lina. “I’ve had worse,” I say. We try flagging down a car, waving our press badges, shouting, “Help the press! 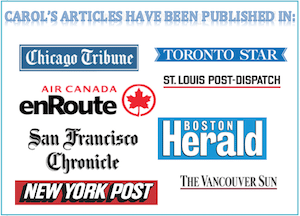 Help the press!” This gets us nowhere fast. But we will not be defeated. And that’s what this travel video is about, Carol and Lina’s Seychelles Carnival Adventure, so watch, laugh and forgive my shaky video – some day I’ll buy a tripod. Once we finally arrive in the Seychelles capital of Victoria, we need to find the carnival stage. We can’t see it but at least, we note, from seeing the muddy ground in front of us, it appears that by missing the bus we also missed a downpour. No raining on our parade. “Okay, thanks,” says the reporter before turning to Lina. 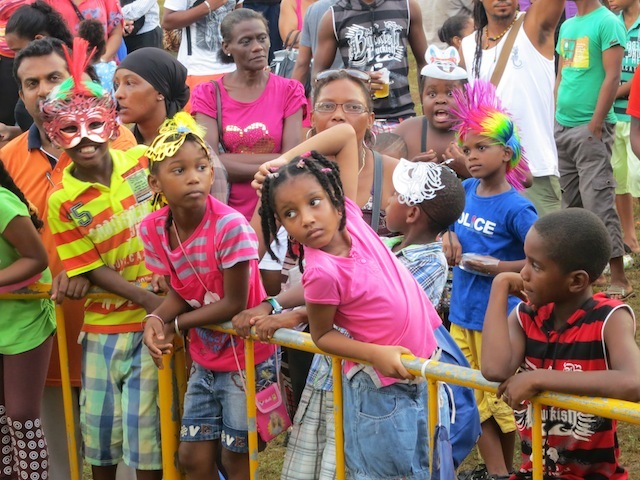 Lina gives a very eloquent run down on how wonderful the carnival is. I’m wondering why she can get her message across without shouting like a banshee like I’d been doing, then I realize that it’s because the music has stopped. 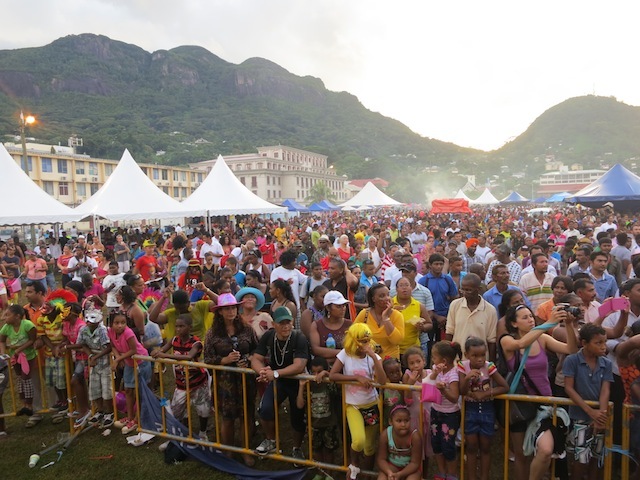 “So, if you could sum up in one word what the Seychelles Carnival is to you, what would it be?” the reporter asks Lina. We all watch Lina, as she struggles to come up with a word. ONE WORD, Lina, YOU CAN DO IT! “Fantastic?” says the reporter, trying to move the interview along. No sooner do we finish our radio interview than I turn around and Lina has disappeared. I finally spot her sitting up in the corner of the stage. How did she get there? Wait, can I go? I want to go to. “No,” says another journalist. “Yes,” says Lina. Guess which answer I go for? I scramble up, try to make myself small and end up with a front row view of the amazing closing ceremonies. 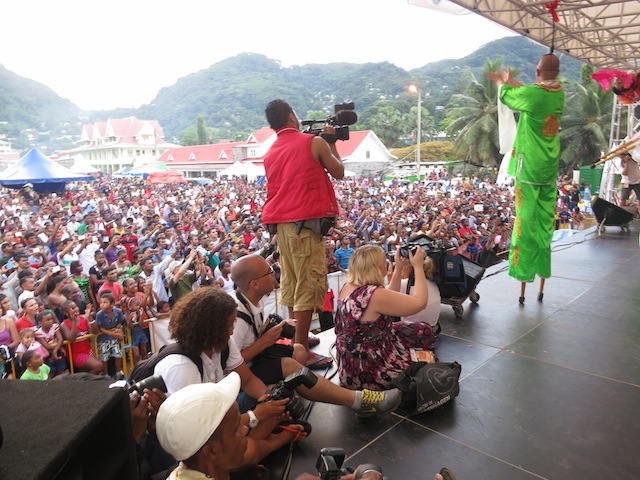 The day might have started out rough but it’s turned out to be the best Seychelles Carnival adventure ever, even when I drop my leopard umbrella off the stage and have to clamber down after it in front of thousands of people. What’s a journalist to do? 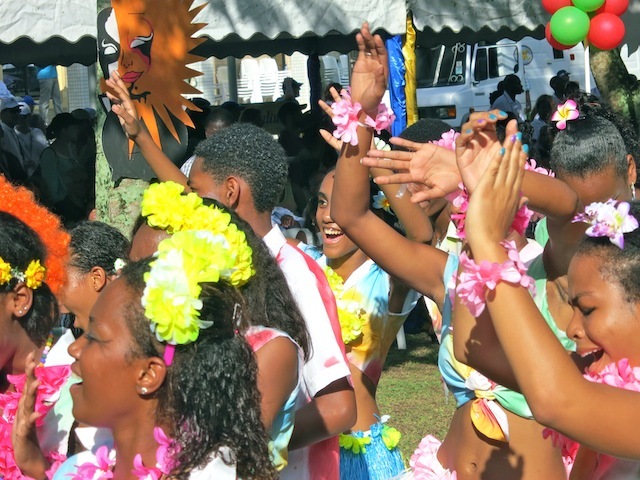 So let the Seychelles Carnival adventure continue! Now that I’ve found my spot, I can relax and enjoy the show. We watch the award-winning Brazilian dancers. Then we watch the award-winning Chinese dancers on stilts. 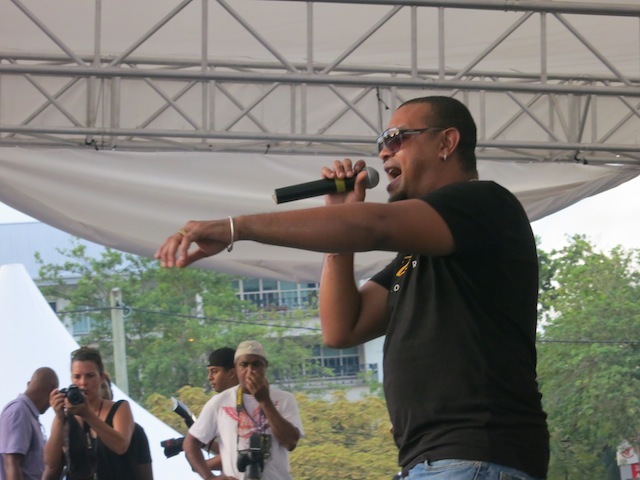 Then my new favourite singer, Benjam, from Reunion Island comes on the stage and my Seychelles Carnival adventure happiness is complete. And Happy Carnival day to you, too. Seychelles, I couldn’t love you more. It’s been a great trip! In fact, it’s been LEGENDARY! What fabulous photos, Carol! I had no idea the Carnival International de Victoria was the fifth largest in the world. You just know it had to be a cool adventure with new friends named Wolfgang, Elvis and Kitty. Wandering Carol! 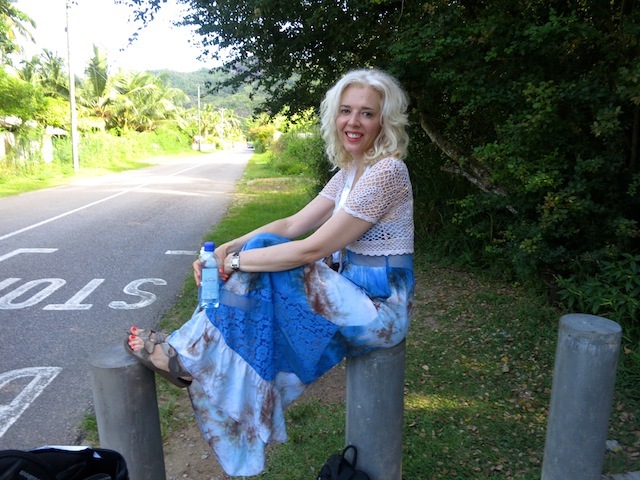 I’m so happy that you documented our epic Seychelles adventure! I was feeding a tortoise when I saw the post – got so euphorically happy that I almost let him bite off my finger. Then a baby iguana named Hector started giving me strange looks (or so it seemed) Anyway, the video will be legendary! Let’s do another one in Mauritius sometime soon. Can’t wait to see you again! 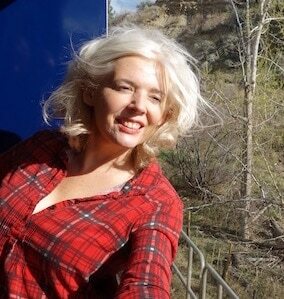 waiting for a Yukon Summer:) living vicariously through your travel adventures…..GOOD FOR YOU!!!!!!!! Thanks, Kelly! How was St. Martin?